2017 Cressey Sports Performance Fall Seminar - We just announced that this popular annual event will take place October 22 at our Massachusetts facility. We hope you can make it! Mike Irr on Winning an NBA Championship - I've been friends with both Mike Robertson and Mike Irr for close to 15 years now, so how can I not love this podcast? There are some excellent insights from Irr, who just won a world championship with the Golden State Warriors. Skills Capture a Niche: Relationships Help You Retain It - This was a great post from my business partner, Pete Dupuis. He discusses the concept of niche development in the fitness industry. Teammate - I just finished David Ross' autobiography and really enjoyed it. I'd highly recommend it to any baseball player, coach, or parent without hesitation. If Mom put on your sunscreen, carried your baseball bag, & dropped you off a Gatorade in the dugout, you definitely didn't "grind" today. Register Now for the 6th Annual Cressey Sports Performance Fall Seminar! We're very excited to announce that on Sunday, October 22, we’ll be hosting our sixth annual fall seminar at Cressey Sports Performance. As was the case with our extremely popular fall event over the past five years, this event will showcase the great staff we're fortunate to have as part of our team. Also like last year, we want to make this an affordable event for everyone and create a great forum for industry professionals and fitness enthusiasts alike to interact, exchange ideas, and learn. We're happy to have Perform Better as our official sponsor again this year as well. After designing three different gyms, negotiating five different leases, and building a team of ten fitness professionals, Pete has an informed opinion on gym design and management. In this presentation, he'll introduce you to five of the best, and five of the worst decisions we've made along the way in ten years of operating Cressey Sports Performance. In this presentation, Miguel will analyze performance for rotational athletes, along with discussion on case studies and techniques as they relate to asymmetries, kinetic chains, and biomechanics. This two-part presentation will feature a lecture discussing the understanding the possible origins of dysfunction, and a hands-on component which will dive into a live assessment and exercise selection. Nearly every fitness professional has encountered an athlete or client dealing with lower back pain. In this presentation, Chris will blend his experience of anatomy and muscular referred pain patterns with strength and conditioning and soft-tissue strategies to illustrate how he treats clients experiencing lower back pain. Whether you are new to strength and conditioning, or a seasoned veteran, you will see lower back pain from a new perspective following this presentation. Some male coaches feel uncomfortable coaching female clients. They struggle to formulate an approach with which they're confident, and the client experience is often negatively impacted as a result. In this presentation, Nancy will help coaches learn how to “dance” the line between being awkward and awesome, while sharing her personal philosophy on how to build female confidence in a male dominated gym. Posture is one of the most controversial topics in the fields of health and human performance. In this presentation, Eric will look at the related research and present anecdotal evidence and case studies to bring some clarity to the debate on just how important having "good posture" - if it even exists - really is. In this presentation, John will take a comprehensive look at how we acclimate our untrained youth athletes to the training process at Cressey Sports Performance. This information will include the technical and tactical aspects of executing training sessions in our semi-private group-training model. With this presentation, we kick off a new CSP Fall Seminar tradition: bringing back an accomplished former CSP intern to present from his/her realm of expertise. We're excited to have Jordan back for a no-nonsense open dialogue in which he fields your individual questions and outlines everything you need to know to make a name for yourself in the fitness industry while helping thousands of people all over the world. It is important to understand the difference between functional mobility and flexibility in order to help maximize your movement capabilities. In this interactive presentation, Frank will demonstrate the protocols he implements in improving his CSP Strength Campers' movement quality for long-term success. **Bonus session Saturday, October 21 at 3:00pm. When they were still in diapers, my 2-year-old daughters would always request the ones with "Big Bird" on them. The images on the diaper didn't change how effective it was at doing its job, of course. And, if the paper towels didn't have a picture of Olaf from "Frozen" on them, a temper tantrum might very well occur - even if any regular ol' paper towel would've gotten the job done just as well. They adored the Mickey Mouse sippy cups my mother bought them even though they weren't any better at delivering the beverage than a generic cup. All of these are perfect examples of Brandscaping, a concept to which I was introduced by Andrew Davis in his outstanding book by the same name. In its simplest form, brandscaping is an approach to developing partnerships with other brands who also cater to your target market. Davis spends considerable time discussing how Tony Bennett's resurgence in the past decade has a lot to do with joint ventures with Lady Gaga and the Muppets; they've modernized his classic approach to create a new synergy. As an more applicable fitness industry example, Cressey Sports Performance (baseball strength and conditioning) and New Balance (baseball training apparel and shoes) are a great synergistic fit - and it even led to a limited edition training sneaker. Referrals to and from physical therapists are another example, and the list could go on to include pitching instructors, massage therapists, meal preparation services, and a host of other complementary services. If we look at the classic "here's how you can grow your business," brandscaping is likely the single-best way to grow the "same product, new market" component. Your brandscaping partner recognizes your specific expertise/offering and brings new folks to it. You, in turn, do the same for them. Everybody wins. Unfortunately, though, a lot of fitness professionals get in their own way and "obstruct" opportunities for brandscaping. A big mistake is definitely trying to be everything to everyone. If you're training everyone from cardiac rehab patients, to fitness competitors, to basketball players, to powerlifters, chances are that potential partners are going to struggle to see the specific realm in which you'd be a good partner. When you have a really broad collection of offerings, it's a challenge to market to them. The cardiac rehab patients might hate the internet, the fitness competitors love Instagram, the basketball players are on Twitter, and the powerlifters are on Facebook. Moreover, some fitness professionals mismanage their web presence, even if they have a specific, marketable niche. As an example, if you train high school athletes, but a huge majority of your social media posts are about beer and partying, that's going to be a huge turnoff to their parents (who pay the bills). And, if you're a rockstar when it comes to training middle aged corporate executives, they're likely going to be turned off if all your social media content is shirtless photos of you from your recreational bodybuilding hobby. In wrapping up, there are really three huge takeaways for you as you try to grow your business. First, someone else has your ideal customers. Think about how you can partner with them in a mutually benefical relationship. Second, your ideal customers or brandscaping partners might not be able to appreciate how good a cross-referral or co-banding relationship with you could be because you keep getting in your way. Think about the image you're creating publicly for your business or brand. Third, don't let your daughters boss you around like mine do to me. I normally like to get these sent out on Monday, but I spent a rainy day at Fenway Park yesterday for the annual Cape Cod Baseball League workout. A day late (but no less sincere) here is our recommended reading for the week! 10 Daily Habits of Healthy Lifters - I contributed some experience on sleep tracking to this great roundtable at T-Nation. Setting up for Speed: Base, Balance, and Angles - This is an excellent, to-the-point blog post from Mike Robertson. I wish I'd had it early in my career to help me pick up coaching speed and agility sooner. Want More Clients? Maybe Consider the Following. - I really enjoyed this post from my old friend Tony Gentilcore. It's top-notch stuff for any up-and-coming trainer who is looking to build a larger clientele. If already taking 150 ground balls/day in-season, do you really need extra agility work? NASCAR guys don't hit up go-karts after each race. Keep in mind that we're speaking specifically to the glenohumeral (ball and socket) joint, when in reality the entire shoulder girdle is comprised of many different articulations). As I mentioned, though, the point of this blog is to simplify this discussion. There are a lot of factors that impact how well one is able to do that. It could be cuff strength, scapular control, ligamentous laxity, previous injury, bony changes, faulty thoracic positioning, tissue density, core control, and a host of other issues. These things all - in one way or another - impact how the ball and socket interact. As strength and conditioning and rehabilitation specialists, you still need to understand the most common injuries incurred at the shoulder. You must appreciate population specific norms. And, you need to understand the assessments that determine whether static posture and movement quality are where they need to be. However, you should never get away from always bringing these concepts back to the fact that they all have to do with ball-and-socket interaction. As Einstein once said, "If you can't explain it simply, you don't understand it well enough." That's both the goal of this particular blog, and also in my resource, Sturdy Shoulder Solutions. You can learn more at www.SturdyShoulders.com. I've been crushing audiobooks, print books, and DVDs of late, so it's generated some good material for these weekly installments. Certified Program Design Specialist Course - Robert Dos Remedios just released this course, and I'm working my way through it right now. Program Design is this huge "hole" in industry education; it's so incredibly complex to teach that I'm impressed that Dos even tried to tackle the project! I've enjoyed what I've seen thus far, and this could be a great resource for up-and-coming coaches. It's $100 off this week as an introductory discount. Smart Baseball - I really enjoyed Keith Law's new book, as it delved heavily into the world of advanced statistics in baseball. If you're a casual observer to the sabermetric world, this would be a good read for getting up to speed - and it'll help you watch baseball through a different lens. The Quadruped Rock-Back Test: RIP - Doug Kechijian just published this article that asserts that this classic test probably doesn't hold as much merit for predicting squatting success as one might think. Most fitness industry folks are convinced that their single biggest area for improvement is lead generation. If only they could get more people to know about their gym - and possibly even take a tour - then they'd absolutely blow up. I hate to burst your bubble, but while your lead generation might need work, in the overwhelming majority of businesses, systems and retention are where the biggest opportunities for improvement exist. You see, if you shore things up on these two fronts, you'll create a better product and dramatically increase the number of word-of-mouth referrals you get. Over the life of your business, word-of-mouth should blow any direct mail or Facebook advertising you do out of the water, so why not work on the things that impact it the most? Now that I've gotten that off my chest, I should actually talk a bit about lead generation, as the truth is that it's probably more complex than it's ever been. If you look back 15-20 years, a lot of folks weren't on the internet - and they certainly didn't have social media. It was really, really hard to get in front of people affordably if you were a small business. If you didn't have the cash to pay for radio, TV, newspaper, or billboard ads, your only option for generating leads began and ended with pounding the pavement to shake hands and kiss babies. Nowadays, things are a whole lot different; you can get in front of just about anyone pretty quickly and easily. If this wasn't the case, a kid from small town Maine named Cressey - who didn't even play high school baseball - wouldn't be training more than 100 professional baseball players each offseason. This modern marketing world creates opportunities, but also a lot of noise. People are bombarded by more marketing messages than ever before because we have more devices (phones, tablets, computers, radios) and mediums (Facebook, Twitter, Instagram, Pinterest, Email, etc) than ever before. There is so much noise that people are completely desensitized to the marketing messages that are being sent their way. That means that top of mind awareness is substantially harder to achieve. What does this mean for lead generation in the fitness industry? You have to get in front of people regularly and via a number of different marketing channels. If you're reading this blog, you probably hear from me here, on various social media channels, and via email. Perhaps you read an article by or about me on another website or print magazine or newspaper. We might have interacted with one another at a seminar, or we might have a mutual friend who recommended that you check out EricCressey.com. The point is that you have to stand on your head to make expertise easy to perceive. It's just not good enough to just pay for a newspaper ad and hope for people to show up. This is particularly complex because everyone will perceive expertise differently - and in different places. Teenagers aren't really on Facebook very often, but it's a great marketing avenue for those over the age of 30. Some of the people there might like video content, and others may prefer writing. Every lead must be generated via a unique marketing mix, and that can make it very challenging to be really successful across multiple niches. At Cressey Sports Performance, we can easily market to baseball players, coaches, and parents, but it'd be really hard for us to build a successful discharge program for cardiac and pulmonary rehabilitation patients. It's an entirely different demographic that we'd struggle to access. 1. You probably generate a fair amount of leads but need to do better at making sure they aren't disappearing out the back door while you're so focused on getting more people in the door. 2. You may need to prioritize optimizing your systems to put yourself in the best position possible to deliver a high-quality product (both training and environment) that will yield more word-of-mouth referrals. 3. Make expertise easy to perceive across a variety of marketing mediums, especially if you're trying to cater to multiple demographics. In my blog the other day, I alluded to how I never really thought I'd open a gym. It kind of just happened. And, this experience has led me to the belief that the concept of having a ten-year plan is absurd. Heck, even five years seems like a prohibitively long time to have a plan in today’s rapidly changing world. I went to college in 1999 thinking that I was going to be an accountant. I transferred in 2001 to pursue exercise science, and went to graduate school to pursue a career in strength and conditioning research. In 2003, after a month on campus, I realized I hated organic chemistry and loved training athletes. I moved to Southern Connecticut in 2005, and then to Massachusetts in 2006, then Florida in 2014. These were twists and turns in every direction that couldn’t have been accommodated by a rigid career plan. There are a lot of people reading this blog who are probably stressing about moving to a different college major, making a career change, or relocating for a change of scenery or new opportunity. There are also business owners who are super concerned about building a brand that they can ultimately sell. They're focused on writing books and delivering seminars about the training they do with their clients before they've even truly evaluated whether that training actually works well. As is usually the case with the training side of our industry, a quick solution is always to simplify. Before you start looking at being hugely successful in the long-term, try focusing on being consistently successful in the short-term with whatever it tackling. To paraphrase a hackneyed expression, you have to win the battle before you win the war - and in entrepreneurship, you have to have a successful business before you make the leap to truly building a brand. As this graph from the Bureau of Labor Statistics demonstrates, why have a ten year plan when less than 40% of small businesses are even around at that time period? And, you can bet that this number is substantially lower in the fitness industry, where many start-ups are trainers who have zero business training. I think that this can actually be a big challenge for some upstart companies when they deal with business consultants who are very focused on developing something that can eventually be sold for $100 million dollars. In the push to create systems for scaling things larger, entrepreneurs can lose sight of shorter term opportunities to be profitable and evolve as a business. For this reason, small business consultants usually have much more to offer to fitness start-ups. The fitness business is challenging. Competition is high, the industry is constantly evolving, and there is a lot of "noise" that can distract consumers from pursuing even the highest quality training options. For this reason, most fitness businesses are better off focusing on "winning the day" than "winning the decade." As I noted in my post on Cressey Sports Performance's 10th anniversary, I wanted to use the next few days to outline a few thoughts on the entrepreneurial side of fitness over the next few days. They'll be quick ones - just a few paragraphs each - but hopefully impactful for those of you interested in the business of fitness. To kick things off, I'll talk about opportunity cost, a concept that is actually remarkably applicable to all industries, not just fitness. Briefly, dictionary.com defines opportunity cost as "the money or other benefits lost when pursuing a particular course of action instead of a mutually-exclusive alternative." It's probably best explained with an example. If you go on vacation, the opportunity cost of that time is continuing to work. You leave town and spend a bunch of money on flights, hotels, and touristy things - all while forgoing income at work during that time period. Most people only consider what they spend on the vacation, but your opportunity cost is that lost income. It might also be experiences that you could have had during that time you're vacationing. To be clear, I'm not saying that you should skip all your vacations and just work all the time. I'm just saying that absolutely everything in life has an opportunity cost. The opportunity cost of the coffee I'm drinking as I type this could be a glass of water or tea. Early in your career, the opportunity cost of your time is far less expansive. You need to make money and build your reputation, so you should take on just about every client and continuing education opportunity that comes your way. And, if you want to be successful in writing and speaking, too, then you need to write and speak at every opportunity, even if nobody is or reading listening. The opportunity cost of your time is basically just watching the same episode of Sportscenter for the 47th time. Having spent two years at business school before transferring into an exercise science program, opportunity cost was something of which I was keenly aware of at a young age. With that in mind, during my undergraduate and graduate years, I worked like a dog. I eschewed a social life in order to pick up every hour at the gym I could and do as much reading and writing as I possibly could. This tradeoff proved to be wildly important, as it helped me to build invaluable career capital and financial stability that opened many more doors for me down the road. As an example, I took time off from work, paid for a hotel room, traveled to Washington, DC, and spoke for free at this event in 2006 - and it proved to be a huge boost for my career. Now, many years later, I have harder opportunity cost decisions. In the past week, I've gotten invited to speak in China, Brazil, Poland, and Minnesota. Each one of these poses different travel demands and compensation scenarios that all need to be weighed against time with family, hours coaching at CSP, what I could earn devoting that time somewhere else, and the impact I could have in other capacities. Eleven years after speaking at that DC event, there really isn't any circumstance under which I'd take that particular gig again. A seminar halfway around the world would have been an instant “yes” in 2007, but now, it requires 18 months of planning and time away from family that I’m reluctant to take on. And, I’ve turned down multiple jobs in collegiate and professional sports over the past few years that would have been absolute dream jobs ten years ago. The "dream" changed – and it happened far faster than I could have ever imagined. With respect to point #3, I'd highly recommend Chip and Dan Heath's outstanding book, Decisive. That'll do it for this post. I'll have another brain dump for you soon. Those are the exact words I spoke in casual conversation over dinner on a first date on April 22, 2007. 82 days later I co-founded a gym. When we first moved in, it looked like this. And, 727 days after that conversation, I proposed to the woman across the table from me. That gym turns ten years old this week - and looks like this. We even opened a second gym 1,500 miles away in Jupiter, FL in 2014. Also along the way, I started my consulting company and my wife opened her optometry practice – so we actually have four businesses. This October, Anna and I celebrate seven years of marriage. We have two-year-old twin daughters. She even still likes baseball enough to be my "date" at the All-Star Game. Suffice it to say that – in light of my own personal experiences – I think it’s silly to expect anyone to have a “10-year-plan.” I couldn’t even have a ten month plan. Usually, when my wife asks me what I want for dinner, I stumble all over my words; I often don't even have a ten hour plan. And, I can tell you that we sure as heck didn’t know much about entrepreneurship. If you need proof, my business partner, Pete, and I wrote our business plan on a napkin at Applebees. The truth is that we kind of got lucky and were smart enough to figure things out as we went. I guess you could say that CSP's success has really been reflective of the old quote, "Luck is where preparation meets opportunity." This blog could go in a lot of different ways from here. I could list out a bunch of different business lessons I’ve learned – and I’ve definitely learned a ton. I could talk about all the things I love about my “job” – and encourage you to go start your own gym. I could talk about all the things that drive me bonkers at my job – and do my best to talk you out of opening one. Instead, though, I’ll just end it with a heartfelt thank you. 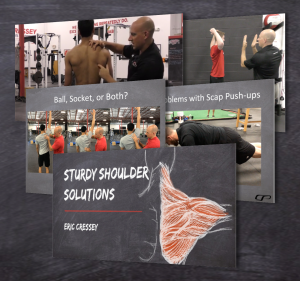 Everyone who reads this blog – whether you’ve actually stepped foot in a Cressey Sports Performance facility, purchased one of my products, or attended a seminar with us – has had an immeasurable impact on us getting to this day. To my family, co-founders, staff, friends, mentors, customers, and suppliers: I appreciate you all tremendously, and the truth is that we are most "lucky" to have so many great people supporting us. I hope to be writing another one of these posts when we get to Year 20, but I’m afraid I don’t have a great track record with ten-year plans. I guess you’ll have to stay tuned. In the meantime, though, I'm going to use the next few days to write up some lessons we've learned over the course of decade of fitness business entrepreneurship. I'll roll multiple posts out per day, so be sure to check back regularly.